In "my universe" the FTL technology of choice is the classic jump drive. 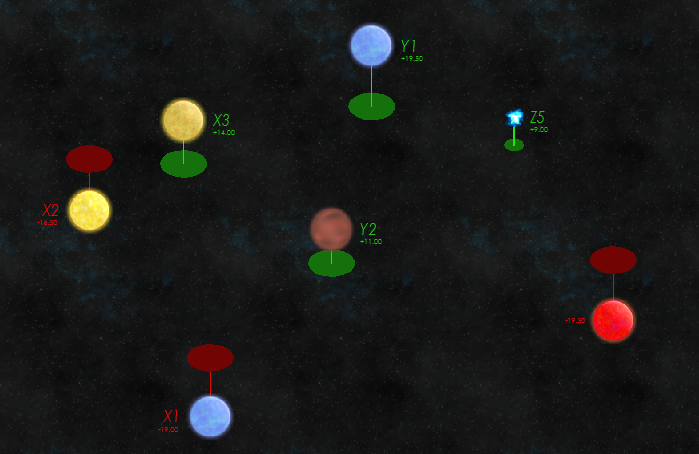 A ftl capable craft moves from one jump point in one system to another jump point in another system. Transit time is instant or only a couple of hours at maximum. Jump Nodes at lagrange points mark those point were a transition is possible. this create a network of lanes - the traveled distance is depended on those lanes. Its not possible or should not be possible to leave a lane before you reach the end. Distance traveled could be hundreds or only a a couple of LY per jump. If a lane is not established the "real" distance doesn't matter. So for example you want to move from X2 towards X3 - the real distance is only 2 LY. However the lane from X2 moves to Y2 from there to Z5 then back to X3. Per node there is only one incoming and one outgoing lane. A junction can happen in a system but it needs at least an extra node for each lane. while FTL travel is fast - interplanetary travel is not. No fancy reaction less multi hundred g drives. Usually fusion torches that burn hydrogen obtained from water. In emergencies the water can be put in the exhaust to generate more thrust... but usually this would hardly exceed 2-3g acceleration and will deplete your fuel reserves. Alternative would include some kind of Ion-Drive or Magneto Plasma Drive that need huge engines to produce the energy but only minimal fuel. The distance between Lagrange points and habitable planets are usually several AU. Usually each FTL capable craft is a huge one that let smaller ships dock. the energy consumption for a FTL jump is exorbitant smaller ships that should move into gravity wells usually don't have the mass for those storage banks and engines. The ferry is the biggest of the FTL capable crafts - with vast spaces with artificial gravity (slow spinning hull) The sub-light drives are hardly more than "park" drives that should prevent the ferry drifting into eternity or "falling" into the sun. Smaller than the ferry and a significant mass is consumed by "ion drives" that can use the extra energy for movement instead of creating a jump field. The BUS is used when moving through a different node in a system with a junction. It's still slower than a real "sub-light" craft, so it might be necessary for docked ships to leave the BUS and travel on their own. A possible appliance might be a sector patrol ship - BattleCruiser or Destroyer. Auxiliary ships can dock during the jump produce - but move on their own in "real space"
I created this setting to have something like "space" borders. These borders are only existent on the "ftl subway lane network plan". I admit I'm not 100% sure if ferry's should be 100% neutral or be part of a star nations navy. For the ongoing question I will define them as neutral lines, nations only use the BUS method. A except from the "lane network plan"
There are two lanes with junctions (2 nodes) in X2 and Z5. Only Y2 is not a border world because there are at least 2 jumps necessary. Those lanes are crossing borders - because the "unknown" physics of space lanes don't care for the politics of mortal. This brings us to the important point of "politics" a single ferry might travel on a lane that crosses several borders. To blockade or to destroy that ferry will affect other planets and the life of billions. It is possible to have multiple ferry's on a lane. While jumping are never 100% accurate and dispense randomly there is a minimal possibility that accidents can happen. So the "big ferry lines" - neutral ship lines have schedules planed some years in advance. Those schedules should prevent that two ferry's jump into the same system at the same node. Those "neutral" lines can carry troops but will not move them between borders of enemy nations. So a ferry can carry soldiers from X2 to X3 without issues. Information between systems change only with ships jumping from system to system. A invasion force from the "ocre lane nation" invade z5. They invade because z5 has no habitable planets or gas giants so the wayward guard stations there are poorly maned and expensive to maintain. there is only a jump station near the magenta lane. Its primary objective is to collect tolls or to control passing ferry for contraband or hidden military units. You are naval commander of the nation actually controlling the Z5 system. You know that the other nation will attack there. While Z5 is not of worth its can cut off - X3. Simple because you can't send troops by using ferry's. Its possible to send battlecruisers but those can't jump two jumps in quick succession. So you need to fight through a blockade and this will cost dearly. Of course you can blockade the other node - but the main difference is that your blockade of the other junction will be very expensive - need of fuel, spare parts other important things - a fortress alone is not a very effective way in blockading a node (simple because there is the necessary need of a distance of minimal a light minute between node and nearest object. So vaporizing incoming ships is not going to happen. Of course the other nation is in the same position as you. 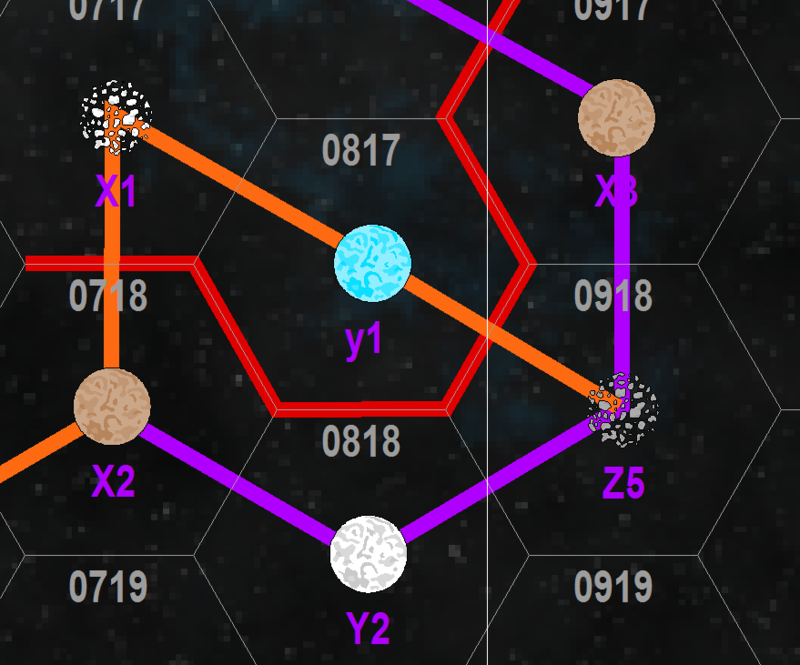 It need to move and maintain blockading forces from their node towards your node. At first. But when X3 falls the support of the blockade is much simpler. So if Z5 falls - X3 will follow - and then you need to protect Y2 - that was not a frontier world to begin with. As a sector commander how would you defend Y2? Yes you want to hold Y2 at all costs. Z5 is the door step, X3 is the gate but Y2 is the price. You bolster the defense of X3 - you have plans in motion that will allow troops and weapons be ferried by neutral ships towards X3 disguised as merchants and cargo. Goal is to hold X3 as long as possible so that any further expanse of your enemy is delayed for years. You have planed it for the very long shot. You want X3 to fall most of your troops on X3 have gone silent and are hidden. You send a sublight tender to x3 that will arrive in 3 years. This is approx the time the other nation need to capture X3 and consolidate their hold. You attack on your own and try to capture y1. I hope this question is not to broad. I ask you to choose a "plan" and why did you choose this plan. As an alternative can you provide a plan on your own? Boiling this down, the crux of the matter is you are dealing with traditional naval strategy. Instead of "lanes" or whatever say sea lanes, and instead of nodes say "choke points". So in the real world, we might ask how a naval conflict between Inda and China might play out. The PLAN needs to exit the South China Sea via gaps in the First Island Chain, so the Chinese will either have to neutralize the various nations by diplomacy, threats of force or military action to fight their way out, or be forced to abandon the enterprise altogether. 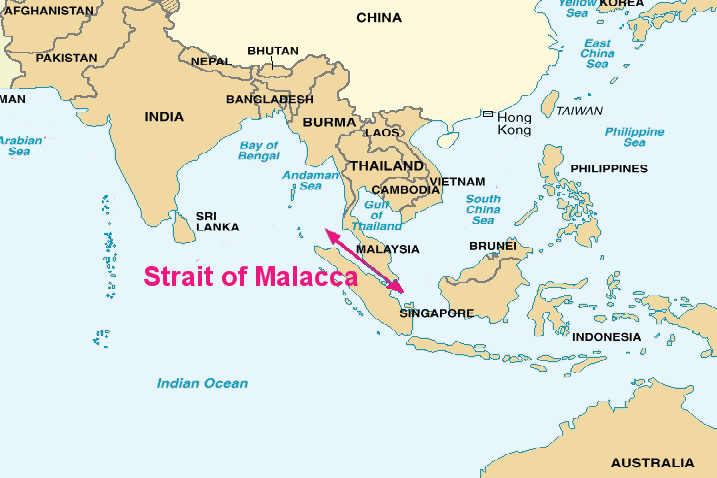 The Indians could fight their battle defensively by blockading the Straits of Malacca and preventing the PLAN's entry into the Indian Ocean, and using diplomacy, threats of force or military action to turn the various nations in the First Island Chain against the Chinese and prevent the PLAN from being able to reach the Indian Ocean in force. Now in both this example and your example, putting up a naval blockade or erecting orbital fortresses at the choke points isn't 100% effective. The enemy could use overwhelming power to force the passage. They could sneak through in disguised merchant ships (perhaps carrying WMD's, or hiding SoF troops in the hold, or even carrying computer malware concealed in trade goods). They might take "the long way round", coming through unguarded gates in neutral or unaligned territories. In our analogy, the PLAN might hold a blue water exercise in the Pacific, then sail around the world and enter the Indian Ocean through the Cape of Good Hope in the south of Africa. Depending on how effective communications are, this might work in your scenario as a means of achieving surprise. I won't answer the other questions, some are up to you as an author (i.e. how many ships can be in a "lane" at any one time). The driving consideration will be the control of the choke points and the ability to deny or force passage. All your other assumptions will be built around that major fact, including the composition of fleets (what proportion of the fleet are jump capable ships when non jump capable ships can more cheaply and effectively block the jump point? ), fleet logistics, what sorts of drives are more advantageous in inertial space and so on. Not the answer you're looking for? Browse other questions tagged reality-check technology space-travel faster-than-light or ask your own question.